Tape Measure Product details & dimensions Question Mark Have a question about this product? We have recieved your request and your wood sample should be with you very soon. 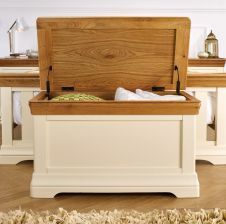 We are offering the lowest UK prices for these French Farmhouse Cream Painted Country Oak Blanket boxes. 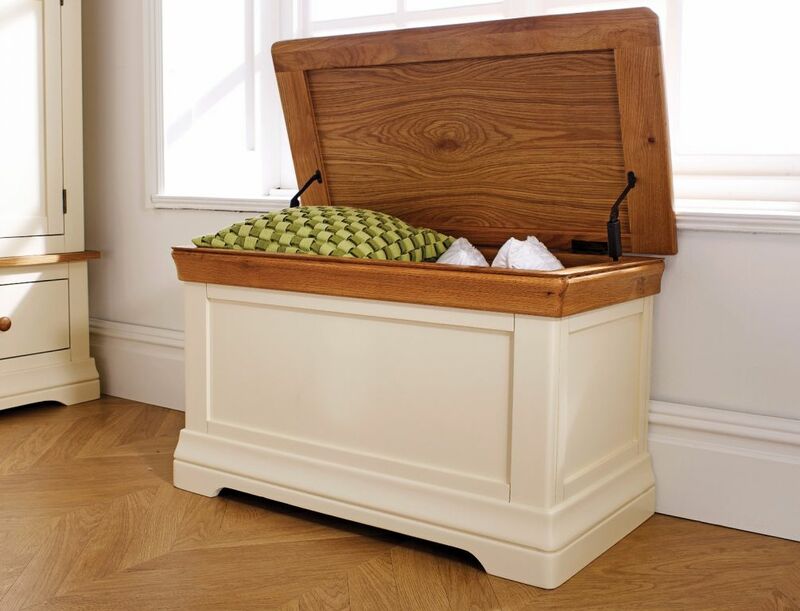 Hand made from sustainable American oak with a hard wearing painted finish these oak topped storages boxes are ideal for placing at the end of a matching oak bed. Great for storing clothing or kiddies toys! Delivered fully assembled and ready to use. Most standard postcodes are available for FREE 2 MAN DELIVERY. Delivery timescales are quoted as 10 - 15 business days but over 80% of customers get delivery within 10 days and you will be called by a member of our transport team to schedule in the delivery day with you. We use our own staff and vehicles for this premium 2 man service because we know how important it is to offer a great delivery service to our customers. Some smaller items are available with a 48hr EXPRESS SHIPPING SERVICE which can be selected on the checkout page. Delivery is within 2 business days when ordered by 11am. The vast majority of our furniture comes FULLY ASSEMBLED out of the box but some items such as the upper sections of wardrobes & beds will require some minimal assembly or they would not fit through the doors of most homes and tables and benches will require the legs attaching. From 5th Feb 2019 we are rolling out an ASSEMBLY SERVICE on our checkout page where customers can select to pay a small charge for our own 2 man delivery team to assemble items such as wardrobes, beds and larger tables for most postcode areas covered by our own delivery teams. More details can be found on our delivery web page. View our returns policy and furniture care web page. Superb quality at a fabulous price. I am very pleased with my purchase of the blanket box which I am using for storage in our conservatory. I think it’s stylish and well made. I like the fact it is fully assembled on delivery and I particularly liked the communication prior to delivery which was excellent. All things considered I The it is good value and I am overall very pleased. Perfectly as described and seems like a solid piece of furniture. Delivery tool a while but happy with the purchase overall. Very strong and sturdy. Just the job, and NO flat packs. All every was perfect. Will certainly be using this firm again. Lovely sturdy storage box, really well made, nice size and finish. 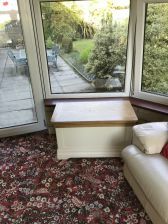 I was worried that as I wanted the box to go in my kitchen it might look funny because you generally associate a blanket box with a bedroom but it looks great against my oak kitchen. I'm really pleased with it, thank you. It's perfect addition to my bedroom. Well impressed, excellent quality, excellent price and excellent customer service. A fantastic purchase. The gentleman that delivered the otteman was extremely helpful and took the purchase upto the desired room. He was polite and courteous and a credit to your company. Author didn't leave any comments. 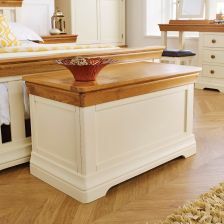 The blanket box / ottoman looks amazing in our bedroom, matching our recently purchased wooden bed frame. Really good quality and value for money. We visited many shops in our quest to purchase a new bed I found this on line and was a bit wary because the price was so much better then what we had seen in shops ,but decided to purchase.Honest we were absolutely thrilled the bed is absolutely beautiful really good quality and looks as good as in the picture.we also bought some more of the farmhouse country range and it looks fantastic. Lovely quality furniture... true to the pictures and great customer service... I would recommend to family and friends. 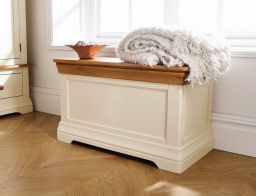 Very pleased with the blanket box excellent quality and good customer service. Also arrived sooner than I was expecting. This arrived quicker than expected & I love it! We bought it for blankets and some of our baby’s toys we didn’t want to keep out on show & there is plenty of room in it for everything that we wanted it for. I love the look of it & it’s very good quality. 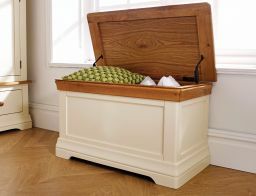 The blanket box is a really nice product and has enabled us to tidy away all of the grandchildren’s toys in the garden room. Came as described. It is sturdy without being too heavy. The only niggle is that the colour is more cream than shown in the picture - I would have preferred more of a white colour. absolutely beautiful furniture. I ordered the triple wardrobe, the longest set of drawers, two bedside cabinets, dressing table and blanket box , all in cream and oak tops. all beautifully packaged The service was first class and delivered on time without one scratch. one of the best companies I have ever dealt with and I have dealt with a few! Highly recommend a company that keeps up to its name! I love the blanket box suits my cottage. Have passed your name on to my friends. As good as it looks in the pics on the site ! Value for money and delivery polite and helpful (helped me carry upstairs ) highly recommend this product . 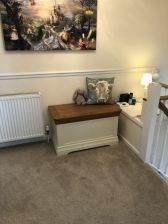 This was ok but didn't go with our decor so change it for the oak blanket box which we are well pleased with and fits perfectly. Attractive and well made piece of furniture. Very good value. I brought this to use as a shoe box in my porch. Excellent quality and very well made. Good value for money and I’m so pleased with my purchase. Good quality for a very reasonable price! Really happy with the Blanket Box. It's very roomy and of good quality. I received it within 3 days of ordering it. The contact from the supplier was excellent as they told me exactly when I would receive it. It looks exactly like the picture and fits in with all my other Farmhouse Country Oak furniture. I would recommend this company. This is a really nice product. Very pleased with it. It seems to be constructed very well and has a lovely polished top. 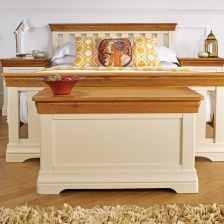 It will match our other bedroom furniture very well and was a very reasonable price. Also the delivery service was very good and prompt. Would recommend this product. Lovely piece of solid furniture, well packed, good delivery service! I am very pleased to find it has good brackets to avoid the lid falling down on your hands old is very nice and true colours as per the advert. I shall use this company again! 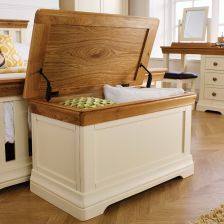 I had purchased two other items of bedroom furniture from this range as I had been very pleased with the appearace and the storage capacity so decided to purchase the blanket box to enhance and complete the refurbishing of my bedroom. I would however like to add that the after sales service I received from the staff at Top Furniture following delivery my first purchase of a wardrobe that was not up to standard was superb, staff were very responsive and quick to make amends. I have not been disappointed and would (and will) certainly recommend this company to friends and family. Good size, v good price. Oak top is v nice but can't tell what the main body of the box is made of, it is very solid but feels wrapped/artificial rather than painted wood. Delivery was very quick and efficient. But there is A LOT of packaging, without a car I have no idea how I am going to get rid of the boxes, so if ordering furniture from here, be aware you'll be left with a lot of awkward rubbish and recycling! Thank you for your review, We do ensure that our products come well protected and packaged to prevent any damage occurring to the items during transportation. Apologies if this caused any inconvenience to you when disposing of it. Nice solid box good value for money. A petite looking yet sizeable storage box that looks very at home in our house. The box feels very solid and we felt it offered the best value for money when we were shopping online. This fits exactly and looks exactly how we expected. It is in our kitchen full of boots and shoes. My only negative comment is that the workmanship around the screw holes inside is a bit rough and ready BUT having said that it was an extremely good price and looks great and does the job we wanted it for. I was very pleased with the blanket chest. Comparing it to similar products it is good value for money and exactly what I wanted. it arrived well packed and undamaged. I would recommend this product. Top Furniture has teamed up with Close Brothers to offer our customers some very competitive finance options. Still Unsure about buying online?